Thief ants are among the most abundant insects in the midwest, but most people will never see them. 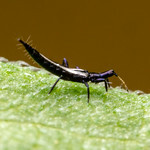 They are small- only about 2mm long- and spend most of their time underground. The large relatively large size of the queens indicates a species capable of raising new colonies from workers fed entirely on the body reserves of young queens like this one. 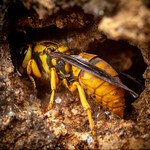 She will fly off, mate, and tunnel underground when she finds a suitable nesting site. Incidentally, this whole drama played out on our front walkway. Urban lots can host plenty of nature for those willing to look. The coy pose on the third shot is excellent — I’m sure you created that pink background somehow, but I can’t make out what it is. I think that there may be a red brick in the background. Just a guess though. An excellent guess, though. My front walk is red brick- that’s exactly what it is! I think I have seen them (in Michigan). Perhaps they are the ants that make abundant mounds on my lawn. They are small, have this color, and they sure are numerous. Why are the workers hanging onto the queen in the 1st photo? What do the males of this species look like? I would expect the females of the species ‘know how to distinguish’ the males, although their definition could differ from ours, LOL.